Anyone who talks about anything should have done proper research, right? Especially when it comes to health information. I firmly believe this, and that’s why I wrote an entire blog post on how important research really is for credibility. But, research doesn’t always have to come from PubMed. 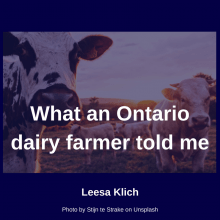 So, I had an unexpected chance to chat up an Ontario dairy farmer last weekend on my road trip. My #1 takeaway from our conversation doesn’t surprise me at all. It’s that much of what Canadians “know” about agriculture is actually about US agriculture. And, Canadian agriculture is different. Now, this is not a shot at international farming practices – Just because I went to Canada’s “moo U” doesn’t mean I know much about farming (obviously I don’t). This post is meant to clarify that much of the information we Canadians “know” about agriculture actually does NOT apply to us. The reason this doesn’t surprise me is because I’ve seen this time and time again. As Canadians, we’re exposed to A LOT of US media and entertainment (including “edutainment”). Sometimes we don’t make the connection that we’re not them. In fact, this realization that Canadians get too much US health information inspired me to write this post on What all Canadians should know about our food and supplement laws about two years ago. The largest dairy farm in the US has up to 20,000 cows. But, the largest dairy farm in Ontario has close to 650. This is unlike the images of massive CAFOs (concentrated animal feeding operations) in many documentaries. In fact, the typical dairy farm in Canada is family-owned and has 77 cows. There is no growth hormone (rBGH – recombinant bovine growth hormone) allowed in our dairy cows (unlike what I saw in #thecorporation). Even though, back in 1999, an expert panel found no human health concerns from using it; however, there were animal health concerns. The milk board sets quotas to prevent overproduction, and ensure a fair price for farmers. In order to keep smaller farmers in business and not get taken over by huge corporations there are limits on purchasing others’ quotas. Those limits include a minimum of 5-years in business before being able to buy others’ quotas, and not being allowed to buy more than 2% of your quota per year. This prevents big corporate farms from swallowing up smaller family farms. And how this is all going to play out in terms of new trade agreement negotiations…I have no idea. Let me know what you think in the comments below. The reason I wanted to share this is because I finally got to speak with a real live farmer! And I was, and hope you too, are intelligently skeptical, and cautiously open, to new information. Do you know much about the dairy industry in Canada? Or how the Canadian and US agricultural practices differ? I’d love to learn more, please share in the comments. I have in NO way been paid by or am affiliated with the dairy industry. Yes, I know the controversies(1). And yes, I drink milk. Honestly, I’ve written a book all about calcium, including the dairy controversy. You can get it for free here. It has 40 scientific references (including large clinical studies, meta-analyses, and systematic reviews, i.e. NOT cherry-picked). Also, Health Canada is now undergoing a review of the food guide, and are “de-emphasizing” meat and dairy. That’s fine by me. Even though I do eat meat and dairy, most Canadians will benefit from eating more plants. Hands down. My bottom line is that dairy is NOT necessary for nutrition; but without it, it is HARD to get enough calcium. Calcium is a common nutrient deficiency/insufficiency in Canada. In fact, over 80% of women between the ages of 50 & 70 do NOT get enough calcium from food. Even though about half take calcium supplements, over 55% STILL don’t get enough calcium (from food & supps combined). And most people get most of their calcium from dairy. Without dairy, almost everyone would not get enough calcium. So, if you don’t want to consume dairy, PLEASE be very cognizant of the actual amount of calcium in what you eat and drink. My book includes a calcium chart listing the amounts of calcium in dozens of foods (and a reference for each one so you can check yourself). I’m personally at risk of osteoporosis, but then again, 1 out of every 3 Canadian women will get an osteoporotic fracture, so get your calcium (and vitamins D & K) from somewhere – preferably food; dairy or not! I’m proud to say that my science education is from Canada’s biggest “Moo U,” the University of Guelph. If you’re ever in town in March, there are a few events I like to go to. On the second Saturday is the annual Toxicology Symposium. During the third weekend they have a family-friendly open house called College Royal – Here are some of my pics from the 2018 event. In fact, I’m in awesome company as a UofG grad! Did you know that the ASAP Science guys, Greg & Mitch got their science degrees from University of Guelph? So did Rick Smith, co-author of Slow Death by Rubber Duck and Toxin Toxout. He’s the past Executive Director of Environmental Defense, currently at the Broadbent Institute. (I’ve included the Amazon affiliate links if you’d like to purchase one or more of them and throw me a small commission, while not paying one cent more). Personally, I earned my B.Sc. in Biomedical Toxicology with a minor in Chemistry. Then I went on to do my M.Sc. in Biomedical Toxicology in the department of Human Biology and Nutritional Science. Here’s a short article about his work (see the “Research Brief”). And another with an actual photo of the lab I did countless Western blots in. Dairy is not an essential food; but you still need to get enough calcium every day. There is A LOT of information about US agriculture practices, and not enough about Canadian ones. I have no idea how new trade negotiations are going to affect Canadian agricultural standards. I, and some other cool science communicators, went to Canada’s largest “Moo U” (University of Guelph), and loved it. What do you think? Do you know much about the dairy industry in Canada? Or how the Canadian and US agricultural practices differ? What school did you go to? Do you have any comments or questions? (1) Thorning, T.K., Raben, A., Tholstrup, T., Soedamah-Muthu, S.S., Givens, I. & Astrup, A. (2016). Milk and dairy products: good or bad for human health? An assessment of the totality of scientific evidence. Food & Nutrition Research, 60(1). Great article, Leesa. You are a excellent writer/researcher.